The difference the right “wheels” make! Championing needs has enabled Therapy Pro client Keren to go “up” in the world. Keren is a quietly spoken and very determined 26-year-old living in regional Queensland. She travels about 40km to Toowoomba for TAFE classes in a business administration diploma and is about to mark her 10th anniversary working at a supermarket. Keren relishes independence – but from the moment she entered the world, 14 weeks premature, it’s been hard-fought. 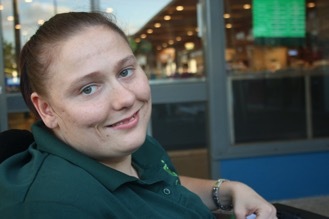 Keren has cerebral palsy with weakness down the left side preventing her from ever walking. When her trusty old wheelchair ‘clapped out’ in 2017, NDIS was willing for it to be repaired. Therapy Pro occupational therapist Anne Newsome looked at Keren’s personal needs as well as her environment. Keren has a flat attached to the family home on a rural property on the Darling Downs. She prides herself on being independent. She works, studies; goes out with friends. She doesn’t want to be tucked into bed like a child and would prefer not to rely on others for personal hygiene. Therapy Pro’s clinical assessment resulted in the prescription of a replacement power drive wheelchair that enabled Keren’s growing independence . 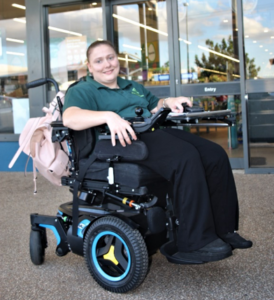 In March 2018, Keren took delivery of her new ‘wheels’, a powered all-terrain wheelchair with custom backrest. The wheels are sturdy and stable, great for driving over uneven surfaces. Keren has been bogged on her family’s rural property just wheeling from the house to the car after rain and stuck on a pedestrian island of a busy main road in the small town where she works. She now safely purrs along her town’s streets after work to catch up with friends and relatives. Hand controls enable Keren to manoeuvre where she wants. The wheelchair also has a lift and tilt feature which sounds like fun but has serious and practical applications. The lift and tilt assists Keren with independent functions like moving to a toilet and getting into bed. BONUS – Keren can now reach higher shelves when checking the ticketing of products in the supermarket where she works!